that works at 0.51 GeV with beam currents higher than 1 A in operation since 1998. DAFNE has a full energy injector system consisting of a 60 m long LINAC (LINear ACcelerator) and an accumulator that is a small 0.51GeV storage ring. Electron beam injection is performed in decay mode with frequent injections. 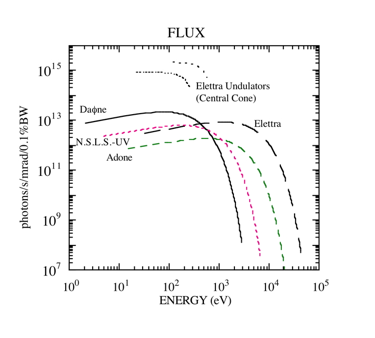 The photon energy range produced by the DAFNE electron ring goes from few eV up to 3 keV and is fully used by three existing and two new beamlines. The SINBAD IR beamline, that started its activity in 2003, is the first Italian synchrotron radiation IR beamline and is mainly dedicated to imaging on biological tissues and cells. In 2011 it was upgraded to be able to image living cells at submicrometric spatial resolution. The calls for proposals for DAFNE-L are published twice a year. The deadlines are regularly on 20 June and 18 December. The DAΦNE-Light facility does support submission through XML standardized form. You can download the PDF version and check DAΦNE-Light website for more information.